2-Pce screw together body construction. PTFE Body Seal, Viton Seat. 20 bar pressure rated. -20 / +120 deg C Temp rated. The valve offers substantial advantages over other spring check valves available on the market. We are able to offer full material certification. Sizes 1 1/4” - 2” are CE marked in accordance with the PED. 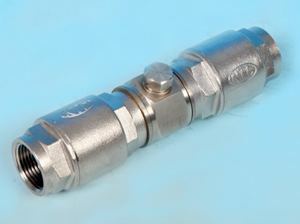 The 2-pce body construction allows the valve to be maintained. 20 bar/g pressure rating.